Ironically, our bright little American Copper may not be so American after all. Its two host plants in our area are both non-natives: sheep sorrel (Rumex acetosella) and Curly Dock (Rumex crispus). It is found most often in dry, disturbed areas. Most writers view it as conspecific with the Flame Copper or Small Copper (Lycaena phlaes) of Europe, though a few prefer to designate it as subspecies ‘americana.” It actually most closely resembles the Nordic or “polaris” race in Europe. The species is holarctic, found northward to the Arctic regions in North America. Opler and Krizek (1984) are probably correct in believing that the eastern populations of American Copper arrived here along with the European colonists. But some authors have demurred, with Layberry 1998 seeing some visible differences from European specimens, and Glassberg 1999 pointing out that native butterflies have often quickly latched on to introduced plant hosts, finding them quite sustaining. To date, no DNA work has been done on this interesting question, although that should surely settle the matter. A key problem with the “native” argument in the case of American Copper is that it is hard to imagine what this butterfly’s original host might have been: there simply does not seem to be a suitable plant available, at least here in the northeast. All other native Rumex species, such as orbiculatus (used by the Bronze Copper) and verticillatus and salicifolius and maritimus, are wetland-associated plants. Of the other plants mentioned by Scott (1986) as hosts, Oxyria digyna, mountain-sorrel, is a Eurasian alpine found only on Mt. Washington in our area. It is used by American Copper in alpine areas in Canada (Layberry). And R. hastatulus, or dune sorrel, was introduced in Massachusetts, as was R. acetosa, or garden sorrel (Sorrie and Somers 1999). We may never know exactly how or when the American Copper arrived in the eastern United States; but its lack of native hosts, and concentration on a small number of Eurasian hosts in disturbed areas, led even Scudder to conclude that “It would appear more probable on general grounds that [our butterfly] originated in the Old World” (Scudder 1897: 209). American Copper is on Thaddeus Harris’ list of butterflies collected in the Boston area 1820-26 (Harris n.d. "List"). He collected one specimen April 15, 1827, and another in Cambridge May 15, 1830 (Harris 1822-1850 Index Lepidopterum). He knew the butterfly well, though it was apparently not “injurious” enough to mention in his 1841 report. He proposed to call it L. Americana, separating it from the L. phleas of Europe, but Scudder was more struck with the resemblance. Both Harris and Scudder agree that it was “very abundant everywhere” in New England in the late 1800s, with Scudder describing three broods each year for most of Massachusetts, only one host plant (Rumex acetosella) as far as he knew, basking behavior, two parasites, and bird predators (Scudder, 1862; 1889:1008-9). Thoreau observed this butterfly in Concord on several occasions: on July 29, 1853, he counted ten on a single aster plant (Stichter 2009b). Only two hosts, sheep-sorrel (Rumex acetosella), and curly dock (Rumex crispus) are normally listed for our area. Scott (1986) also lists garden sorrel (Rumex acetosa). All are introduced. In fact the American Copper in our area appears to use exclusively sheep sorrel. In 2009 searches in eastern and central Massachusetts, Sam Jaffe found caterpillars only on sheep sorrel; never on curly dock (Jaffe 2010). The Connecticut Atlas also found it in the wild only on sheep-sorrel. Both Rumex species are common and widespread; they are found in every county in Massachusetts today (Sorrie and Somers 1999). Today, American Copper is found in a great variety of disturbed habitats, especially abandoned fields, power line cuts, and railroad track rights of way. But there are limits to how much hardscape this species can take, and converting disused railroad tracks to paved bike paths, for example, decreases habitat for this species. American Copper undoubtedly benefited from forest clearing and agricultural development in the 1700s and 1800s (Table 1), and continued to thrive through the 1900s despite much suburban development, although it cannot survive in heavily hardscaped and landscaped areas. According to MBC records, the American Copper is a Common species today, but it is not Abundant statewide to the same degree as the Cabbage White or the Clouded and Orange Sulphurs (Table 5). The 1986-90 MAS Atlas also termed the American Copper “Common.” It was found in 169 out of 723 blocks, making it seem abundant, but it was somewhat less common in the western third of the state. The Breed et al. (2012) list-length study of 1992-2010 MBC data showed little change in detectibility of American Copper over this time period. But MBC reports per total butterfly trips do show important yearly variations (Chart 14), suggesting that American Copper numbers rose between 1996 and 2000, and were lower before and afterward. But this result should be treated with caution, since some of the localized population build-ups reported may have been over-estimated by enthusiastic observers. The records since about 1994 include several large estimates made on some NABA counts. In addition to 1996 and 1997, 1999 was undoubtedly a big year for American Coppers: the largest unadjusted statewide totals were reported that year, and markedly exceed the unadjusted totals of other years. Analyses of American Copper numbers per total party-hours on the long-running Concord NABA Count (1992-2009), and on the large Northern Worcester NABA Count (1996-2009), both agree that 1999 was a year with unusually high numbers of American Coppers per party-hour of effort. The Northern Worcester result shows American Coppers also high per party-hour in 1997, 2000, and 2004. American Copper numbers are generally lower and more variable from year to year on the three Berkshire counts, and especially the Northern Berkshire count, than on mid-state and eastern counts. In contrast, American Coppers always show up in very good numbers (100-200) on the Martha’s Vineyard NABA count, and usually in very good numbers (200-1500) on the Northern Worcester count. 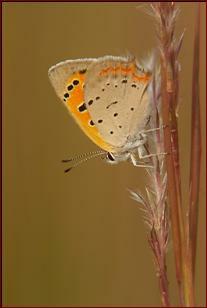 The Martha's Vineyard checklist reports American Copper as "common to abundant" on that island (Pelikan 2002). Vern Laux reports 6 American Coppers on Nantucket on 5/4/2011, and LoPresti (2011) reports it as a breeding resident there. In the 1940's, Jones and Kimball (1943) reported American Copper as "abundant" on both islands. The American Copper has at least three overlapping broods, and is on the wing from mid-April to frost (http://www.naba.org/chapters/nabambc/flight-dates-chart.asp). The largest numbers are seen in May, in July, and again in early September. The number of broods seems to have remained the same since Scudder’s day; he found it “triple-brooded throughout Massachusetts (excepting perhaps in parts of Berkshire), including the elevated towns of Andover and Princeton,” but changing to two broods just north of this state (1889: 1005). Early flight dates: In the 23 years of MBC data (1991-2013), there are five years in which the first observation of an American Copper occurred April 15 or earlier. These five sightings are 3/20/2012 Carlisle, S. Perkins (the next earliest date that year was 4/14/2012 Middleboro, K. Anderson and Milton, M. Arey); 4/4/2010 W. Newbury, B. Zaremba; 4/14/2007 East Longmeadow, K. Parker; 4/15/2000 Wellfleet, J. Sones; and 4/15/1997 Truro J. Sones. In another nine of the 23 years, the first sighting occurred in the last two weeks of April. American Coppers may be appearing earlier in the spring than a century ago, but better evidence is needed. Scudder says that for Massachusetts "the insect makes its appearance from May 10-23 according to the season." He dismisses a March 15 capture date from Harris, and an April 3 capture date in Maine as exceptional due probably to unusually warm springs (1889: 1005; as noted above Thaddeus Harris also reports capturing one on April 15, 1827). However the peak timing of the first, second and third broods would appear to be similar to the late May/June, July, and late August/early September flight peaks described by Scudder. Late flight dates: The last sighting dates are now mostly in October and increasingly, in November. In 9 of the 23 years under review (all post-1998), they have been in November. These nine latest "last sightings" are 11/20/1999 Edgartown Katama, M. Pelikan; 11/11/2008 south Dartmouth, T. Raymond; 11/8/2001 Chilmark, M. Pelikan; 11/6/2013 Somerset, D. Gagnon (photo); 11/4/2012 Oak Bluffs, M. Pelikan; 11/4/2006 Oak Bluffs, M. Pelikan; 11/4/2000 Edgartown, M. Pelikan; 11/1/2005 south Dartmouth, M. Champagne; and 11/1/2004 Andover, H. Hoople. As can be seen, many of the latest reports are from Martha's Vineyard or the south coast. The tail, or ending part of the flight period has probably lengthened since Scudder's time. Scudder says that the last brood “has generally entirely disappeared by the close of the month [September]” (1889:1006). A century later, there are obviously many American Coppers now flying throughout October and into November. The American Copper's continental range presently extends north to the tundra; it is not found in the hot southeastern and Gulf Coast states, except in the mountains. However, it is the most adaptable of our three coppers, and could be expected to withstand some climate warming in our region.